My name is Sakinah Muhammad. I graduated from Temple University in May as a criminal-justice major with a minor in psychology. My next step is working for Houston Teach for America Corps while I attend graduate school at St. Thomas University. So much of where I am now is because of what I learned, and the support I received, from the mentor I was assigned through a nonprofit that is dedicated to preparing kids like me to succeed in college. We hear a lot about mentoring from the adults who use it to give back, but I want to talk about it from the perspective of a younger person—someone whose education and life were changed over the past eight years by a great organization and a committed adult. In the ninth grade, there was an announcement made at school (Cesar Chavez Public Charter School for Public Policy in Washington, D.C.) about a program named College Bound. My best friend and I hadn't thought about college before. But we thought that College Bound might be cool to do if we participated together. We signed up for the program, which partners with organizations around the city, including BET Networks, American Institute for Research and the Cesar Chavez Public Charter School. But it wasn’t until the end-of-the-year celebration that we saw students, like us, receiving scholarships to go to college, that we really got it. It made an impact on us. From that point on, we got more actively involved and participated in College Bound for four years. We went on college tours, retreats and participated in SAT prep. Eventually I went on to win Student of the Year and a scholarship to attend Temple University. College Bound assigned me a partner who worked with me on SAT prep. I applied for and received numerous scholarships that I learned about directly from College Bound. My site coordinator literally handed me the scholarship application and said, “Apply.” I was able to network with other individuals and students through various events. After high school, my partner became my virtual mentor. College Bound still sent us care packages and I relished them checking up on us. It was exciting. I am grateful for the virtual mentoring provided by College Bound because prioritizing my time had been the most challenging problem during my time at Temple. I didn’t have time to do all the things I needed to do if I wasn’t on top of my schedule. I was on the executive board of my school’s student event-planning board, I worked two jobs and then I had 19 credits. It was really a lot to manage. My virtual mentor, Lauren Balog, helped me with all of this, and I invited her to my graduation. In the years we've worked together, she's given me advice on family, adult situations, spending money and spring break. During all of college, she was like another parent figure that I was able to talk to. College Bound changed my life by offering me new experiences and offering me a new perspective than most D.C. high school students’. I am not alone in my gratitude to College Bound. My best friend from Chavez will graduate next year from Virginia Commonwealth University. I think I speak for us and for all participants in the program when I say, now that we understand how much mentoring can do, we can’t wait to share what we’ve learned with another generation of kids. 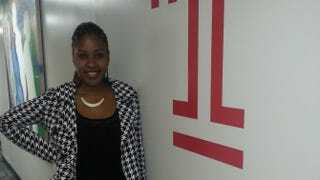 Sakinah Muhammad is a graduate of Temple University. We want to hear your story. Send pitches for My Thing Is, a forum for personal narratives by The Root’s readers and contributors, to MyThingIs@theroot.com.